Home > VoIP Support FAQ > Domain Names > What are the different types of Web Forwarding for domains? What are the different types of Web Forwarding for domains? When choosing Masked forwarding the visitor's browser will still show your domain name in the address bar even after forwarding to the target website. Permanent forwarding ensures that search engines register the new location as the permanent destination for your domain. 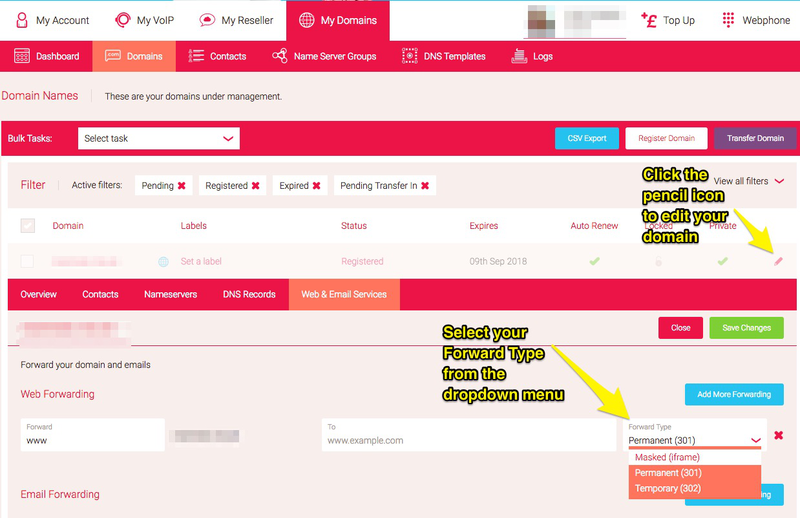 This should be the preferred setting unless you plan on forwarding your domain elsewhere in the future. Temporary web forwarding simply does the opposite, making sure that search engines register that the target location is a temporary destination. As a result search engines such as Google will continue checking the domain name for the target location, in case it changes.